#CookForSyria and Pophams Bakery are excited to launch a limited edition #BakeForSyria pastry with a Syrian inspired twist. 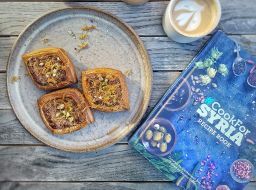 Launching on 16th March at Pophams Islington bakery for one month only, the one-off #BakeForSyria oval shaped croissant will have a baklava filling of ground almonds, walnuts, rose water and a pistachio paste. The pastry will cost £3.20 and 100% of proceeds will go to Unicef's Syrian Relief Fund, raising money to contribute towards Unicef’s appeal for the children of Syria via NextGen London.